There might be a lot of WiFi hotspot software for Windows. But, as far as we look at the popularity of the tools, Connectify stands out as the best WiFi hotspot software for Windows. However, no software on the Internet would impress every user. So, depending on personal preferences, people do look out for Connectify Alternatives to replace as the best WiFi hotspot software for PC. If you are not sure why you should be looking for a Connectify alternative; fret not, we will tell you about the “not so good” things while using Connectify as well. Do note that the alternatives have been aimed at the people who do not like Connectify or simply want a different WiFi hotspot software with simpler options or advanced options. Why Would You Need To Consider An Alternative To Connectify? Well, let’s face it – Connectify is not a bad software. It is a perfect one. But, as per your requirements, it might not be the perfect solution to your problem. Maybe you want an entirely free WiFi hotspot software that simply creates the hotspot with no other fancy options. In either case, you want an even more powerful software tool to take control of your hotspot without spending a penny. Also, in case it does not work on your Windows system, you could always try the Connectify alternatives when you have them. Note: All of the software alternatives to Connectify are compatible with Windows 7/8/8.1/10. 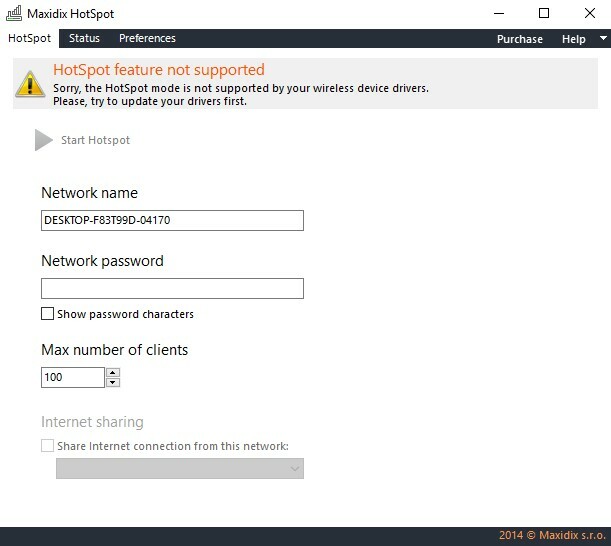 Here, we take a look at 10 of the Connectify alternatives to replace as one of the best WiFi Hotspot software for Windows. After Connectify if anything out there comes close to it, OSToto Hostpost would be the best bet. Unlike Connectify, OSToto Hotspot is completely free WiFi hotspot software with no paid plans offered. 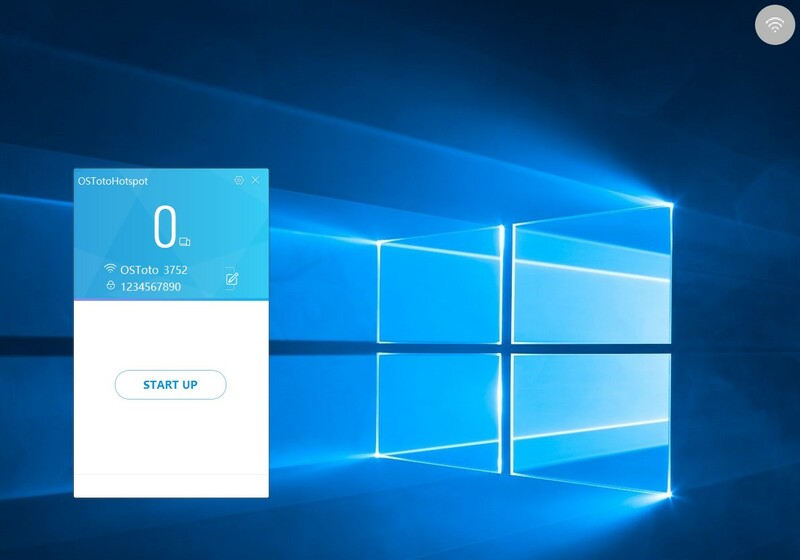 OSToto Hotspot is compatible with Windows 10 and all the way down to Windows 7. It is a quite useful WiFi hotspot app that comes in a small package. The file size is only 3.23 MB. Among all the other WiFi hotspot software mentioned here, the user interface of OSToto is my personal favorite. You can blacklist any of your connected devices if you find anything unauthorized or simply do not want them to connect. You get the ability to utilize the timer, and the hotspot will shut down accordingly. The best thing about OSToto is – it is advertising free! You would not encounter annoying pop ups while using it. So, there’s no question about any hidden fee. 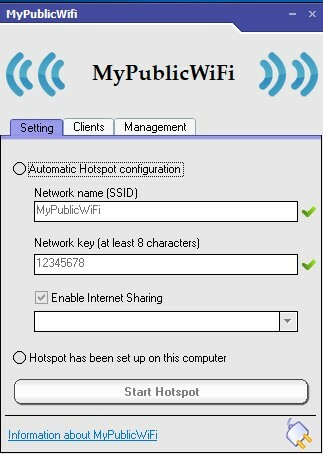 MyPublicWiFi is a quite straightforward application to get started with a WiFi hotspot on Windows. It does not offer a great user interface, but it is understandable and looks decent. The developers of this WiFi hotspot software are not actively maintaining it, but it does the work as expected. When compared to OSToto Hotspot, you would not get such functionalities with this one. You can set the application to auto-start whenever your PC boots up. Also, to prevent misuse of your network, you can choose to disable the use of file-sharing sites (like BitTorrent) on your network. You might have a few level of control over your WiFi hotspot, but it would not be enough in case you are looking to set a public WiFi hotspot with numerous people connecting. 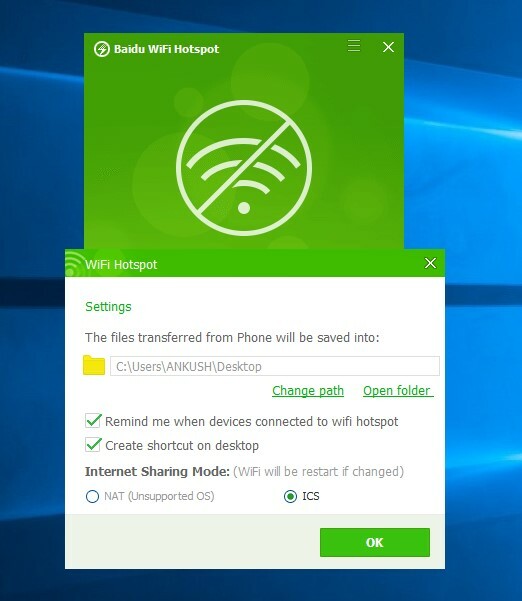 Baidu WiFi hotspot is yet another impressive WiFi hotspot software for PC. It is one of the best Connectify alternatives with a promising user interface. It looks more like a lite version to some extent, but that’s just it. Baidu WiFi Hotspot is a simple software tool to help you create a WiFi hotspot. With Baidu WiFi Hotspot, you do not get a lot of options. In the settings, you will observe the option to change the storage path for file sharing from your phone. The Internet sharing mode would be automatically selected according to your OS. The good news with Baidu is – it is still in active development. So, you may encounter software updates to ensure that it does the work as expected. If it offers a good UI and is actively maintained why do we give MyPublicWifi more priority here? Well, it is because it proves to be annoying for a single drawback. When you close the application, it does not minimize itself to the icon tray, rather it completely closes. Also, you would not find an option to minimize the window. Maxidix Hotspot is one of the best premium Connectify alternatives out there. With other WiFi hotspot software tools, you may not get advanced options and facilities. Maybe it is because those aren’t paid options. You can try Maxidix hotspot by downloading it. To take advantage of all the functionalities offered, you just need to pay $20 as a one-time fee and get the WiFi suite from Maxidix. It is actually a good deal when compared to Connectify which costs nearly $60. When we dive deep into the features offered by Connectify, it might fall short with Maxidix, but in our opinion, it is enough for personal usage. Here’s an image for comparison while deciding to purchase WiFi suite from Maxidix. You can set a network password, limit the number of devices connecting to the Hotspot, and enable/disable Internet sharing from right inside the WiFi hotspot app. 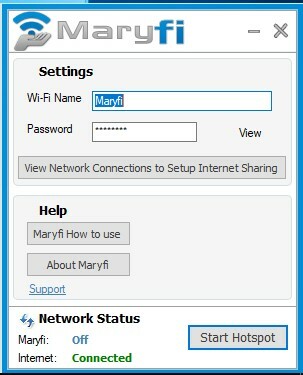 Maryfi is a very simple approach to make it easy for a user to create a WiFi hotspot for free. You only get the option to set a password to your network. No other options included. Even if the developers are not actively maintaining it, it still works fine with the latest Windows 10. It should be one of the best Connectify alternatives if you were looking for something just to create a hotspot and protect it with a password (basic level of security). Yet another alternative to Connectify. It is an ad-supported free WiFi hotspot solution with some quite useful capabilities. The advertisement within the application is not much of a concern. But, in case, if you do not want ads to be displayed at all, you can get rid of the Ads by getting the Ad-free version for $11 as a one-time fee. 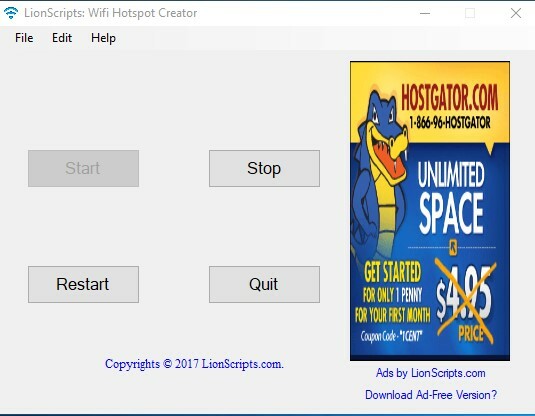 I would not personally recommend going for the ad-free version because one Advertisement should not bother you at all after you minimize the application after hotspot creation. It does not offer a great user interface but works as expected. Apart from the ability to set a password, you would not get any other advanced options with this WiFi hotspot creator software for PC. 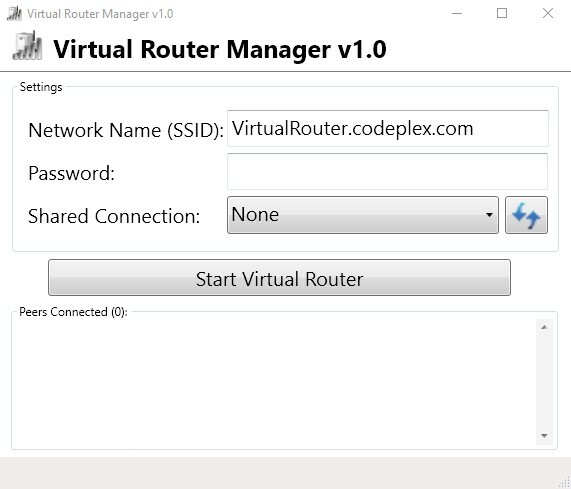 A simple Connectify alternative – Virtual Router Manager v1.0. Even if the developers are not actively maintaining it, it still is compatible with Windows 10 and lower. It offers no advanced functionalities. Also, it is ad-free with no purchase or subscription required. You may just set a password for your network. Now that we have taken a look at the top 7 best Connectify alternatives, you could choose any of the mentioned WiFi hotspot software tools to replace Connectify as the best WiFi hotspot software for your usage. OSToto is a direct alternative with almost similar features. The rest of the WiFi hotspot software tool depends on your personal preference whether or not you want an advanced software tool with a great user interface or simply a WiFi hotspot software tool that works. How to Create WiFi Hotspot Using Command Prompt and Share Files Easily?